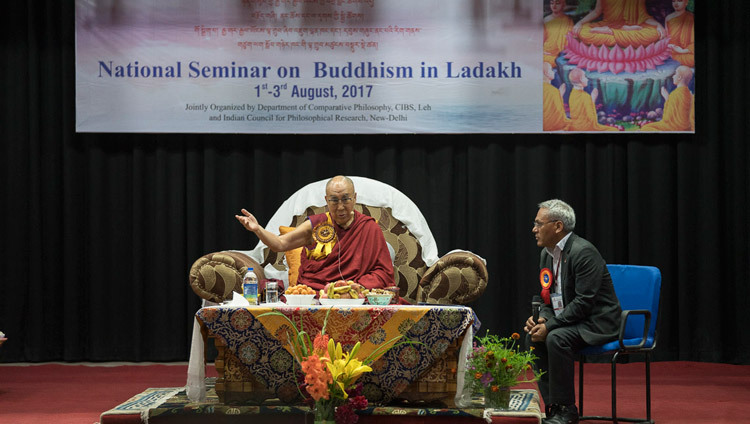 Leh, Ladakh, J&K, India – For the final engagement of His Holiness the Dalai Lama’s stay in Ladakh this year, he returned to the Arya Nagarjuna Auditorium of the Central Institute of Buddhist Studies (CIBS), Choglamsar. He was welcomed by Director, Prof Konchok Wangdu as Chief Guest at the inauguration of a three day seminar on ‘Buddhism in Ladakh’. His Holiness lit a lamp to indicate the formal opening of the event and took his seat. Students of the Institute proceeded to chant auspicious prayers, including the ‘Heart Sutra’, in poignant Sanskrit. In his introduction, Prof Konchok Wangdu paid respects to His Holiness on behalf of the people of Ladakh and saluted the other guests and dignitaries. He said it was a great honour for CIBS and the Indian Council for Philosophical Research (ICPR) to welcome His Holiness to the seminar. Prof Wangdu mentioned that since being deemed a University in January 2016 CIBS has been able to design its own curriculum and text books. The Institute has also been able to arrange interactions for its students with corresponding seats of learning in Arunachal Pradesh and Sarnath. Relations are also developing with the University of Japan, as well as universities in Mongolia and Russia. He explained that the theme of the seminar, ‘Buddhism in Ladakh’, had been chosen because, despite material progress in many areas, people remain dissatisfied. Buddhism has a role to play in challenging this unease, which is why students are being counselled to seek peace of mind by tackling their negative emotions and cultivating positive qualities like compassion. Convinced of the value of Buddhist psychology, the Director is proposing to establish a separate department focusing on the science of mind. Prof SR Bhat, Chairman, ICPR, spoke next. “It is a matter of great pleasure and privilege to have His Holiness inaugurate this significant seminar on Buddhism,” he declared. “It concerns both the view of reality and the way of life propounded by Lord Buddha. This remains relevant and necessary in contemporary times; therefore it is important for us to study Buddhist teachings and culture in order to benefit the people of Ladakh, India and the world at large. Describing Buddhism as the finest product of Indian culture, Prof Bhat suggested that if Americans and Europeans can study and embrace it, Ladakhis must be able to do so too. He mentioned that at a conference last week in China, Tibetan scholars made presentations about Indian logic. He stated that he would like to see this happen in India too. He expressed the hope that scholars in this Institute, CIBS, would engage in extensive research with the assurance that the ICPR would support them. He regretted that so many classic texts had perished in their Sanskrit originals, but took encouragement from their being available in Tibetan translations. His Holiness was requested to release three books, two of them published by CIBS: ‘Profound Instruction for Meditation’ translated into English by Dr Konchok Rigzin and ‘Guidance on Definitive Mahamudra’ in Tibetan and Hindi by Dr Thinlay Gurmet. The third book was ‘Vaisheshik Praman Darshan’ by Dr VK Panday. Invited to address the 600 strong gathering, His Holiness began by stating what an honour it was for him to inaugurate this three day seminar on ‘Buddhism in Ladakh’. “The Nalanda Tradition that Shantarakshita brought to Tibet, and which Tibetans have kept alive for more than 1000 years, has since flourished throughout the Himalayan Region. China too is traditionally a Buddhist country and the Chinese are traditionally a Buddhist people. Even now, wherever they have settled around the world we find Buddhist temples there. They keep their faith, but don’t study sufficiently. Only Tibetans have kept up the tradition of rigorous study based on learning the key texts by heart and studying the commentaries of Nalanda masters and those who came after them in Tibet. Even I did this, starting as a child of six or seven. “He gave us the liberty to examine what he said for logical consistency, following the logical strictures of Dignaga, Dharmakirti and Shantarakshita, whose texts are wonderful, but difficult. “If you study, besides observing rituals, you’ll be able to understand what the Buddha taught and defend it in discussions with others. More than 30 years ago, when I thought of entering into dialogue with scientists, an American friend warned me to be careful saying, “Science is a killer of religion.” I thought about that and what the Buddha had advised and decided there was little risk. “We’ve talked principally about cosmology, neurobiology, physics and psychology to mutual benefit. Of course, for me one of the casualties has been that I no longer accept or believe in the traditional Buddhist description of the cosmos with Mt Meru at the centre. But, it seems to me that the Buddha appeared in the world to teach the Four Noble Truths and the Two Truths rather than to map the pattern of the universe. “When I visit non-Buddhist countries, I am careful not to propagate Buddhism. I always advised people from Christian, Jewish or Muslim backgrounds that it’s generally better to stick with the religion they were born to. And when I visit places that are traditionally Buddhist I encourage people to study. I tell them this is more effective than building statues or chortens. In Tsopema some years ago I was invited to consecrate a huge statue of Guru Rinpoche. I do practice in relation to Guru Padmasambhava and I appreciated the statue that had been made. But I also pointed out that even if it remains for 1000 years, it will never speak. “Rather than falling back on blind faith, it is much better to use our intelligence to transform our emotions. I have my own experience of this after more than 60 years of study, analytical meditation and extensive use of logic. What I’ve learned is that there is no rational support for destructive emotions, whereas positive emotions can be enhanced and extended on the basis of reason. “Study in monasteries, nunneries and schools is the proper way to keep our Buddhist traditions alive. His Holiness reviewed his three commitments—to promote compassion in the world and to encourage religious harmony. Thirdly, he is a Tibetan in whom 6 millions have placed their trust. He reminded his audience that in 2011 he not only fully retired from political responsibility, but he put an end to the tradition of Dalai Lamas taking such a role. He reflected that elevating Lamas to such positions is both out of date and redolent of a feudal system. He was prompted to recall that in 1993 at a conference of Western Buddhist instructors in Dharamsala complaints were raised about the apparent misbehaviour of certain Buddhist teachers. It was agreed that if they did not respond to warnings their conduct should be publicised. His Holiness remarked that recently followers of Sogyal Rinpoche, who he knows well, have published detailed objections to his behaviour. Similar reports have surfaced about a teacher in Taiwan. His Holiness made clear that Je Tsongkhapa’s stipulations in his ‘Stages of the Path’ texts about the qualifications of a spiritual teacher, how disciples should follow them and how they should relate to each other should apply in all Tibetan Buddhist traditions, not just the Gelukpa. He reiterated once again the need to study to acquire a broad understanding of the structure of the path. Prof RK Shukla, Member Secretary of ICPR began his words of thanks in Sanskrit in tribute to the Sanskrit Buddhist tradition that flourishes in Ladakh. He declared that the seminar had lofty ambitions and that everyone present was delighted that His Holiness had been able to come. At a final reception on the Shiwatsel ground, the Vice-Chairman of the LBA welcomed His Holiness and all the other guests. On behalf of the people of Ladakh he thanked His Holiness once again for spending more than a month in the region and for teaching in Nubra, Zanskar and Leh. He expressed the fervent hope that he will return next year and promised that he will not be bothered with requests. Students from the Moravian School, the Riglam School, the SOS TCV School and the Ladakh Public School gave charming performances of singing and dancing. Two young men, who rescued a boy who had fallen into the swift flowing River Indus two days ago, were presented to His Holiness. In a short address, His Holiness thanked the students for their entertainment. He observed once again that while Buddhism has flourished from Arunachal in the east to Ladakh in the west, it will only survive on the basis of study and practice. He reiterated the importance of the Nalanda Tradition as a science of mind. Finally, he expressed satisfaction and approval of the religious harmony and sense of community that prevails in Ladakh, and urged those present to take care of it. President of the LBA Youth Wing, Rinchen Namgyal, offered thanks to His Holiness and other distinguished guests for their attendance and expressed gratitude to the organizers and everyone who had contributed the success of the occasion. Lunch was served, after which His Holiness returned to the Shiwatsel Phodrang. 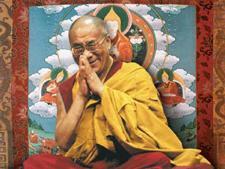 Tomorrow morning, His Holiness will leave Leh and fly to Delhi.